A few weeks ago, after the Brett Favre decision had been “made”, it seemed as though the Vikings’ QB situation was as up in the air as it could be (pending the outcome of a few preseason games). On one hand, you had Tarvaris Jackson, who had a reasonably good season considering his past; but was also noticeably horrible in key parts in his game. On the other hand, you had Sage Rosenfels, who had spent most of his career as a backup for a mediocre team. It was a situation that many coaches wouldn’t like to find themselves in, especially someone like Brad Childress who is sitting on a hot seat that is rising in temperature daily. But as of today, thanks to football’s greatest indecisive player, things are looking better – for now. Favre is one of the greatest quarterbacks ever to play the game. This is an indisputable fact, something that few would debate. However, after missing most of camp, having shoulder surgery, and coming to an extremely hostile environment, will he be able to keep up? Based on his 2008 stats versus those of the existing Vikings QBs, it’s pretty clear that Favre is a better person to start the year, but Jackson may actually be a better option later in terms of QB rating and completion percentage through the final weeks of the season. It’s pretty simple to see that a man with a beat up 39 year old body is going to have problems lasting a full season in a league filled with quick defensive linemen that hit like freight trains, so it’s going to be a plus to have Jackson and Rosenfels waiting in the wings. Of course, New York was quite a bit different than Minnesota, at least in the quality of their offensive line and the talent of their backs and receivers. In Minnesota, having a person like Adrian Peterson can change the way a team would play against someone like Favre, an adjustment that could help save his body from a few hits he would have taken otherwise. In addition, with massive Phil Loadholt securing the right side much more efficiently than his predecessor, and Percy Harvin being used as a versatile utility option, the possibilities stretch a lot further than once expected. Add in speedster Bernard Berrian and a healthy returning hands receiver in Sidney Rice, and you have a team that could finally go much deeper into the playoffs. That is, if Favre stays healthy. The problems surrounding his arrival don’t disappear just because he brings a new dimension to the offense, though. You still have to deal with the fans who have despised Favre every day of their lives since he started in Green Bay, you still have an ailing shoulder that may not be healed come week one, and you still have a guy that needs to learn everything the Vikings use in their offense. The bright side? As a history making QB, you also are familiar with his ability to learn and adapt. Personally, I like this situation as it stands right now, mainly because at first glance you have Brett Favre on your team (and he has a track record to prove that his presence isn’t a bad thing). The only part of it I dislike is the media circus that is sure to follow him around this year, which will distract from the team as it did in New York. 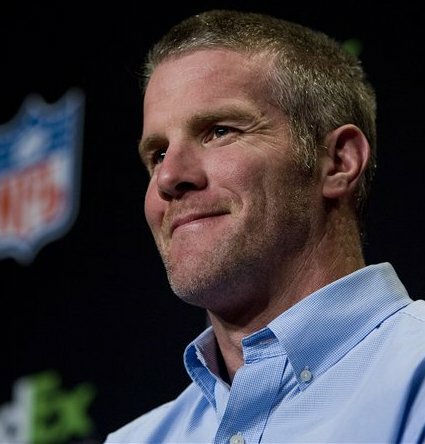 Without focus and without a calm locker room, Favre’s signing could cause more problems than he’s actually worth. Also, with the media circus comes more game broadcasts, which is great for a Vikings fan living in Los Angeles, and good for team revenue. There will also be a ton of new sports cards that collectors can chase, as we all know how awesome a Peterson/Favre dual auto would be. I will be waiting for my “Frozen Favre” lettermen set in the mail. Really, it comes down to this: when you had a bad situation at QB like the Vikings did, it’s never bad when you add a future Hall of Famer who still has some gas left in the tank. Now, does anyone have two tickets to the Vikings game in Lambeau? I’m looking forward to seeing the faces of those fans. I hope Broadway Brett Does well with the Vikings. Lets see he brings hope to the Jets. Jets give up Pennington to Miami. Miami goes to playoffs. Jets play golf. Brett leaves. Brett got our hopes up and now your gonna do the same fot the Vikings fans. Do us all a favor….RETIRE FOR GOOD. You were a great quaterback let the fans remember you that way. Not as another comeback failure!